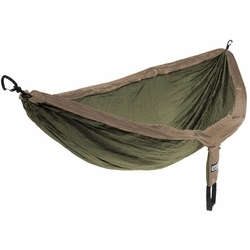 ENO Double Nest Hammock. Eagles Nest Outfitters. The DoubleNest reigns supreme. It's ENO's bread-and-butter. It's your all-access pass to relaxation. Big enough for two and palatial for one, the DoubleNest still manages to stuff easily into its attached compression sack. Take it anywhere, set it up in seconds flat, lay back and Oh, did you want to join me? I've got room for one more! **NOTE: Due to fabric availability, color combinations may be inverted from what is pictured. When producing hammocks, ENO attempts to reduce potential waste by using every bit of fabric available. This means that the color combination of your hammock might be swapped from what is pictured but an awesome combination nonetheless! Folded dimensions	(Dia x L) 4" x 5"
Unfolded dimensions	(L x W) 9' 4" x 6' 2"